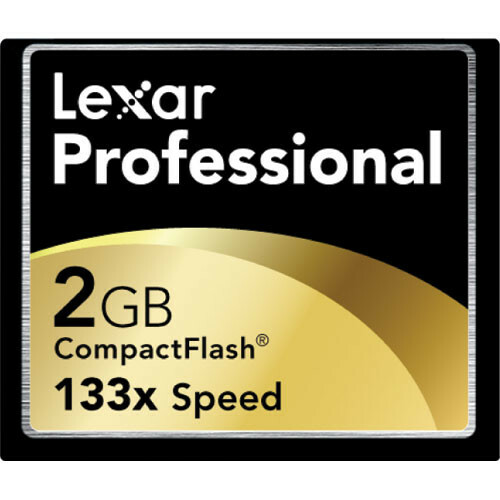 Lexar Media's Professional CompactFlash Memory Cards are ideal for any photographer who demands optimal performance from both the memory card and Digital SLR camera they use. The 133x read & write speed is designed to speed up image capture times by taking advantage of a Digital SLR camera's high-speed processor. For the professional shooter who needs immediate confirmation that they've captured "the Shot" or wants to identify accurate exposure, levels or bracketing range, Lexar's patented speed 133X (20 MB/sec.) is critical. Ideal for fast-paced applications such as photojournalism, sports and fashion, Lexar's high-speed series and professional digital film brings out the ultimate performance from your professional equipment. Professionals know that a single image can be more valuable than all their images combined. So any hard disk failure isn't just a problem. It's a disaster. Lexar's CompactFlash solid-state design means durability, even in harsh conditions. The Digital Film Compliance seal means business. It assures you that your Lexar digital film is 100% compatible with your CompactFlash digital camera. And it's flexible and can be used in other digital devices that support CompactFlash, including PDAs, video recorders and MP3 players. All of Lexar's CompactFlash memory cards meet the CompactFlash Association's specifications and is marked with the CF+ symbol. Note: Not compatible with the "Jump Shot" Card reader.